I can’t think of a better way to end the year than with this intimate dinner with a few close friends. Christmas came a little early, and that was just fine. Four of us met at Bar Boulud, one of my favorite spots in Manhattan. The memories of our epic Dunn vertical here this past spring were seared onto my mind, so I was very much looking forward to dinner. 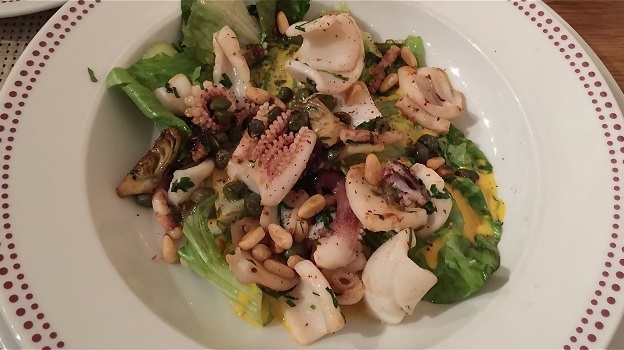 Bar Boulud did not disappoint; everything was fabulous. Our meal was delicious, but, with apologies to the kitchen, the focus was on the wines. What a treat it is to taste and drink two of the most iconic Blancs de Noirs side by side. Bollinger’s 1998 Vieilles Vignes Françaises is quite pretty and lifted in style. A decidedly feminine VVF, the 1998 is starting to show the first signs of tertiary maturity, so it is best enjoyed sooner rather than later. Krug’s 1998 Clos d’Ambonnay is in a different league entirely, with far greater mid-palate richness and overall depth. This may be the best bottle of the 1998 Ambonnay I have had. Tonight, the 1998 is hauntingly beautiful. Domaine de la Romanée-Conti’s 2004 Montrachet is epic, but it needs a good three hours of air to really show all of its cards, and the truth is that it is still a very young wine that isn’t really ready to offer the full breadth of its profoundness. Overall, the 2004 is fairly shy, reserved Montrachet built on energy and tension, with less of the opulence that is found in many other years. Still quite brisk and vibrant, the 2004 will drink well for another 20 years. The 2004 is at its best at the very end of the night, when my only regret is not having saved more. 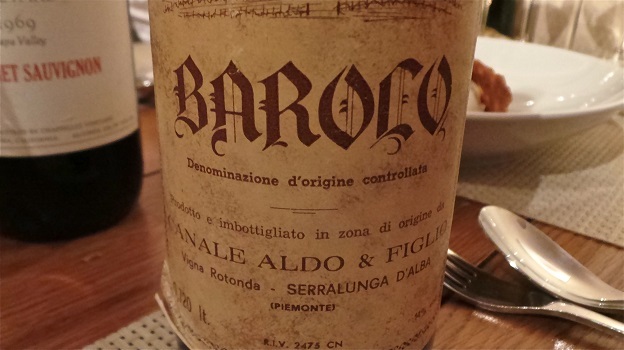 Aldo Canale’s 1975 Barolo Vigna Rotonda is far more than a historical curiosity because of its intriguing label and its origins from the vineyard known today as Vigna Rionda; it is a fabulous wine in its own right. The Canale family of course owned a significant piece – and by many accounts the best piece – in the famed Vigna Rionda. When Aldo Canale’s son, Tommaso, passed away a few years ago, those holdings were divided among three heirs; Davide Rosso, Sergio Germano and Guido Porro. But the 1975 was made during the estate’s glory years, when Aldo Canale sold grapes (and some say also wine) to Bruno Giacosa, who literally put what was then called Collina Rionda on the map with a series of Barolos that remain reference points for what Rionda is and what it should be. Still in great shape for a wine of its age, the 1975 Barolo Vigna Rotonda possesses striking perfume, silky fruit and superb length. The 1975 keeps getting better and better with air, as the mid-palate fleshes out and the aromatics soar. What a privilege it is to drink the 1975, a wine from a long-forgotten vintage, at this glorious peak of expression. The 1969 Chappellet Cabernet Sauvignon is poured and all conversation stops. I can smell the intoxicating bouquet right out of the bottle, but it is the wine’s color and overall intensity that are beyond belief. Graphite, lavender, smoke, herbs and host of intense dark fruits saturate the palate as this stunning Cabernet Sauvignon shows why it is regarded as one the greatest wines ever made in Napa Valley. At times, the textural richness and viscosity are reminiscent of legendary Médocs such as Latour, while the intense savory/smoky notes recall great vintages of La Mission Haut-Brion, but the essence is pure Napa Valley. I have had the 1969 a number of times and it has always been nothing short of remarkable, as it is once again on this night. I am too young to have tasted the 1969 when it was a young wine, but it must have really been something. Readers lucky enough to own bottles can look forward to another 25+ years of exceptional drinking. Philip Togni was just a young man when he made the 1969. He could have retired immediately and still left behind an incredible legacy. Togni has of course gone on to have a brilliant career, but the 1969 Chappellet remains arguably his single greatest achievement. 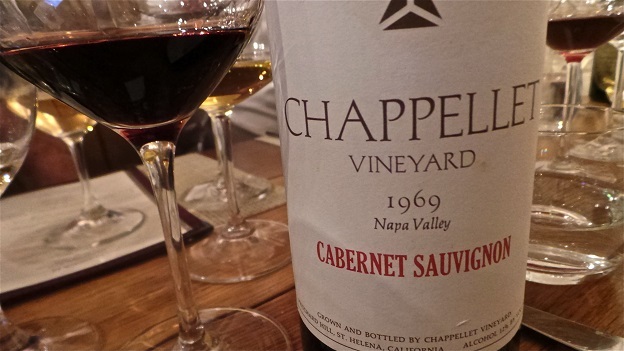 Simply put, Chappellet’s 1969 Cabernet Sauvignon is a testament to the heights that can be reached in Napa Valley and, even more specifically, on Pritchard Hill, where the Chappellets were true pioneers long before the area gained the prestige it enjoys today. 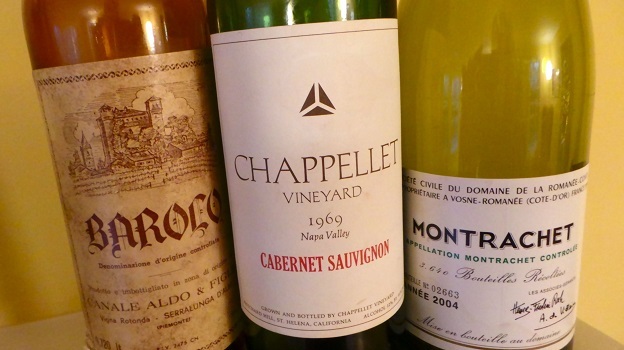 Ultimately great wines inspire friendship, sharing and conversation. We were lucky to enjoy all three during a fabulous dinner full of memories that will last forever. I would like to thank a group of my closest friends for making this evening possible.